“The senators are your voice here on all matters. They are the only ones we’ll be hearing from today.” – Lieutenant Governor Forest to women and women’s allies in the North Carolina Senate Gallery. When the person who oversees the North Carolina Senate tells the public that its voices do not matter, how can we believe in the foundational tenant of “democracy”? On “Independence” day, we are told to celebrate these foundational elements of what our country hypothetically values. The concept has been debatable for as long as it has existed since on Independence Day many people were not independent. Yesterday, though, as I stood among 600 pro-woman supporters at the North Carolina General Assembly, I was reminded of the power of people; today I will celebrate that act of patriotism and celebrate North Carolina’s feminist army. I was reminded that our fight happens every day that we are a part of the social fabric of this state and this nation, a fabric of an American flag that is sewn together with threads of patriarchy that have yet to be fully loosened. On the ground yesterday, if I had to hear the awful news that I did, at least I got to hear it in the company of so many women and allies of women. 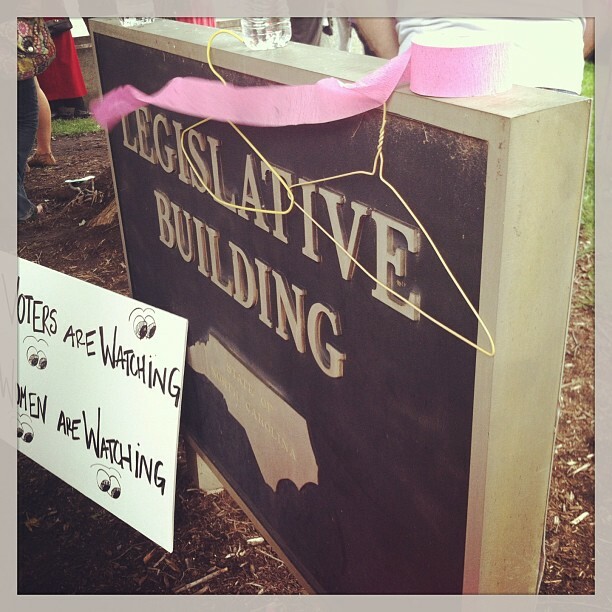 Over 600 people literally organized overnight via social media to get the word out about HB 695 and to call out “shame” on the NCGA. As we yelled “shame,” I thought of all the people we were standing for who could not be there today, perhaps those who are most vulnerable. What about women who had to be at work, who could not drive up to Raleigh, who could not physically be there? 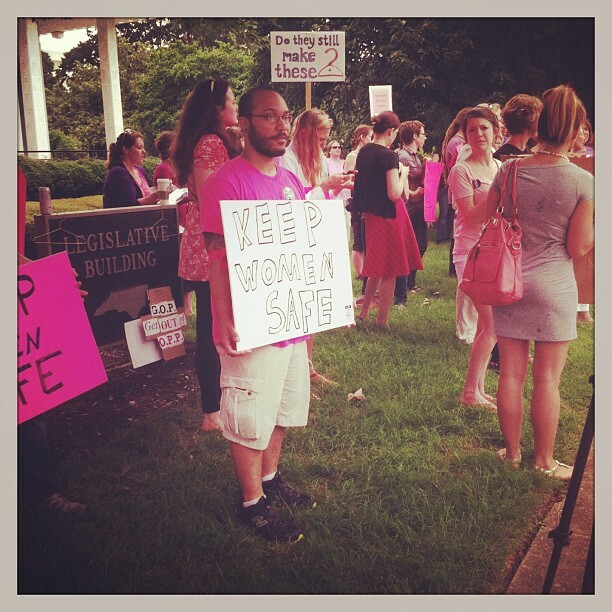 I stood for those women who will not be able to travel all the way to Asheville to receive these reproductive health services since the bill, when signed into law, will shut down the other 35 abortion clinics in the state. There are people who believe that feminism has little relevance in this day and age. There are also people who are ashamed to align with the term “feminist” out of the fear of being called a “radical.” In college I was part of a feminist poetry band, and I proudly call myself a feminist to this day. I recognize that this comes from a privileged position of being able to identify with the word and employ it on a daily basis. I also recognize that so many do not align with the concept of feminism, or they do not align with it in a way to elevate our power and voice. If people think the only time to pay attention to feminist action is when heinous discriminatory legislation comes up in the state Senate, then there are serious issues at stake. The fight begins way before this piece of legislation came up to a vote. The fight happens at the ballot box with the candidates that people choose. The fight happens before then, too. If we do not build each other up, amplify our voices, and present the need for feminism on a constant basis, then who will? Those in power in the NCGA certainly will not. This fight is a daily fight for feminists in North Carolina, in the South, and in “red” states across the nation, and this fight is far from over. Just as with other progressive causes in the South, our work must happen all the time. With my feminist poetry band, we would introduce social justice issues every week at a local coffee shop in the small, rural town of Boiling Springs, North Carolina. We had voices and we shared these voices with the public at large. This is one small example of not only having ideas, but also bringing them into part of the social fabric of an area. We must not be afraid to have these ideas and speak up, with or without a microphone. As we yell “shame,” I know that there is more to do than simply be angry or sad. We have work to do. With the Supreme Court decision on the Voting Rights Act, the NCGA is setting back into motion its discriminatory legislation to substantially reduce voter turnout in the state, with attempts to end early voting, same-day voting registration and voting, and Sunday voting opportunities. Given these threats upon us, we must continue fighting and having a voice. We must get out the vote and register friends to vote. Instead of being angry, we must amplify our voices. We must get to a point where we can be proactive instead of reactive. We must continue to oil our machine of resistance and persistence through continuing to connect our social networks. Born and raised in the South, Collyn is a gal from rural North Carolina who currently lives in Tuscaloosa, Alabama during the academic year. She graduated from Gardner-Webb University (Boiling Springs, NC) in 2011 with degrees in English and Social Sciences. She is currently completing her Master's of Arts in English (Composition, Rhetoric, and English Studies) at The University of Alabama (Tuscaloosa), and she will graduate in May 2013. Collyn enjoys discussing politics, activism, reading, writing, drinking excellent coffee, perusing a bookstore, and conversation. Collyn has been involved in work with the Democratic Party, feminist causes, and LGBTQ advocacy efforts within the South. Absolutely. 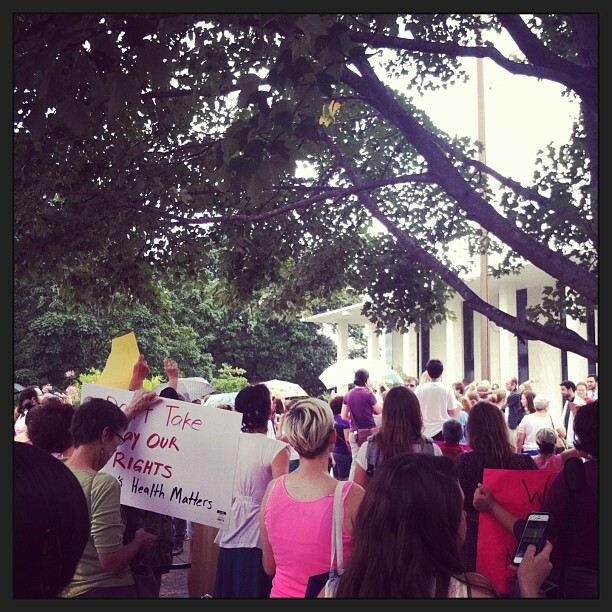 The most important thing is to hold up our dignity and let our voices resonate throughout the state government, whether that be attending events in Raleigh, going to elected officials’ offices, making phone calls, tweeting, face booking, blogging, etc. We must not be silent!